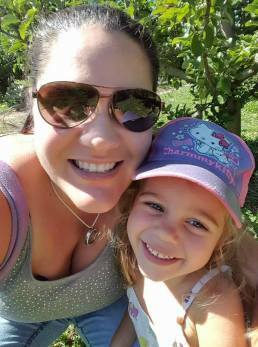 Welcome to our AppleCheeks Giveaway from Baby Footprint in Windsor, Ontario! One lucky winner will win an Applecheeks Bamboo bundle in the brand new Jem color, in their choice of size. Baby Footprint is a Canadian cloth diaper retailer based in Windsor, Ontario. 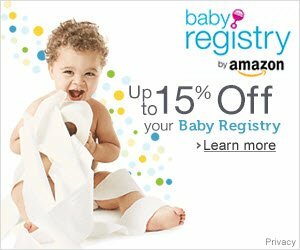 They offer free shipping on orders over $79, and they carry top brands including AppleCheeks, bumGenius, Bummis, Flip, GroVia, Mother-Ease, Rockin' Green, Thirsties, TotsBots, and more! We are excited to be working with Baby Footprint and would love if you would check out their online store. Waterproof envelope cover - made of an outer layer of breathable waterproof polyurethane laminated polyester (PUL) with a soft microfleece inner layer. The envelope can be used as a pocket or an all-in-two, because of the unique design. Absorbent insert - Choose between 2-layer bamboo tri-fold, 3-layer bamboo tri-folds, and stay-dry microfiber inserts topped with soft microfleece. AppleCheeks' envelope opening allows you to choose whether to place the absorbent insert between the fleece and the PUL, offering a stay-dry barrier for your baby's comfort. You can also just lay the insert inside of the cover, and the elastics keep it from shifting while you put the diaper on your baby. The envelope cover is available in 2 sizes - Size 1 fits from approximately 7 to 20 lbs, and Size 2 fits from 20 to 40 lbs. This size 1 cover, in Cherry Tomato, was photographed on my son (shown below) when he was approximately 18 lbs, and there is still one extra set of snaps available. This diaper has 2 rows of snaps (shown above) which allow you to adjust the legs and waist band separately. AppleCheeks has great elastic, too (shown below)! AppleCheeks offers front and back elastic - a feature I love for tummy sleepers! We have used our AppleCheeks through both of our babies over 5 years and (unlike some other brands) the elastics are still in great condition - stretchy and durable. They offer a gentle gathered fit that contains leaks and blow-outs very well. I don't find that the elastics leave red marks, either. 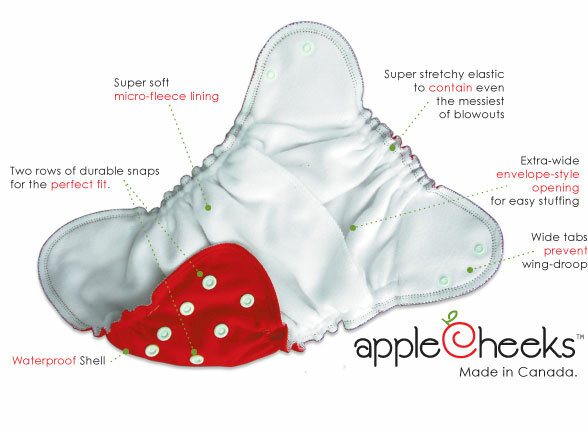 AppleCheeks is known for their wide range of colors, and these diapers hold their value well. They tend to retire a color before introducing a new one, which has increased the appeal of these diapers with collectors. AppleCheeks has just launched a brand new color Jem. And who wouldn't love this vibrant diaper? Canadian retailer The Baby Footprint carries AppleCheeks cloth diapers, including envelope covers ($20), inserts, flushable inserts, wipes, and boosters. They offer discounts on quantities of 6 or more, and all orders over $79 ship for free. There is limited stock of Jem, so be sure to order soon. The Baby Footprint currently has stock in this color, plus lots of other favorites in the AppleCheeks line-up. You might just get lucky enough to win an AppleCheeks! Thanks to The Baby Footprint, one lucky reader will win an AppleCheeks Bamboo Bundle in their choice of size. This bundle includes an envelope cover and 2-layer bamboo insert, and retails for Simply enter the giveaway below using the Rafflecopter widget. Disclosure: I received no compensation for this publication. Thinking About Cloth Diapers is not responsible for prize fulfillment. This giveaway is open to residents of the United States and Canada. Winning entries will be verified. The winner will be contacted by email and must reply within 48 hours or another winner will be chosen. This giveaway is not affiliated with Facebook, Twitter, Pinterest, Instagram, or any other method of social media.